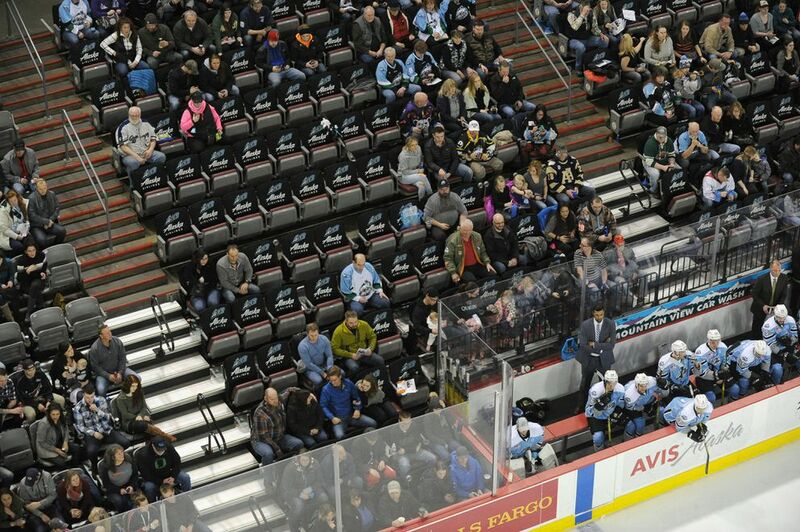 The end of this hockey season will double as the end of the Alaska Aces. The state's only professional sports franchise, a three-time winner of the ECHL's Kelly Cup, announced Thursday morning that it will cease operations after 14 seasons on the circuit two steps below the NHL. The Aces said the decision stemmed from mounting financial losses triggered by plunging attendance, dwindling corporate sponsorships and Alaska's recession-wracked economy. "It's probably one of the toughest business decisions I've ever had to make," said Terry Parks, managing member of a five-man local ownership group. Parks said the Aces lost more than $1 million in 2016 and are projecting losses at the same pace this year. Those losses are split among five owners from the original group that in 2002 bought the franchise — formerly the Anchorage Aces — out of bankruptcy for about $1 million and quickly turned it into a perennial power on the ice and at the box office. 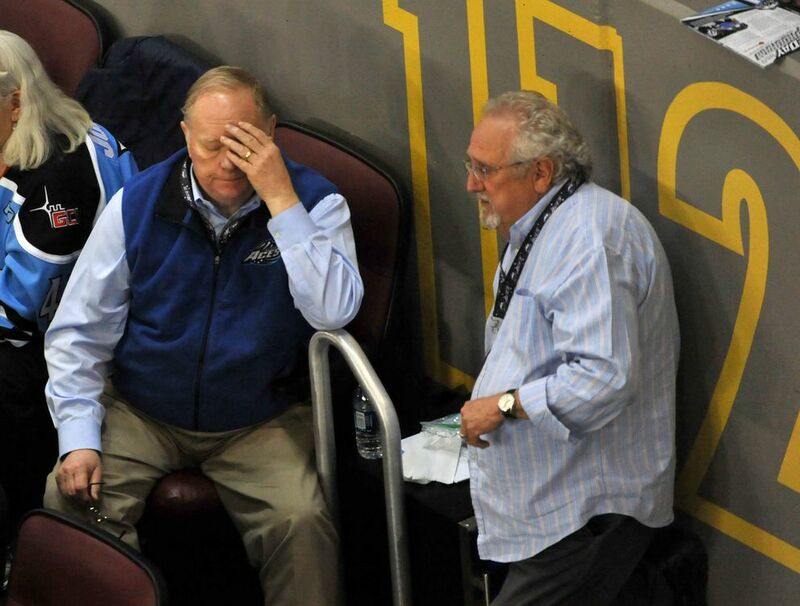 Co-owner Jerry Mackie said folding the club is excruciating, but absorbing such losses is no longer sustainable for owners who have never made money from the franchise. "I think it's an understatement to say this hurts," Mackie said. "It's like losing a family member because you can't get them back. We tried every possible way to save this team and this organization for the community, despite significant financial loss. "At some point in time, you realize there's nothing you can do." The Aces said fans who already have bought season tickets for next season will be fully reimbursed. All Aces players will become free agents in the ECHL at season's end. Tim Coffman, an Aces center who in his fourth season is the club's longest-tenured current player, said news of the franchise's demise pierced him. "I knew things weren't great with the economy in Alaska and I could see attendance was down, but it never crossed my mind it would come to this," Coffman said. "I was shocked. It's kind of crazy to think the team that gave you a career won't be around. "Guys will be OK — they'll find a team. You really feel for the fans, because they love the Aces and they're so passionate. It's just sad. It's a sign of the times." Matt Shasby, a decorated former defenseman who grew up in Eagle River and played four seasons with the Aces after his college career at UAA, helped Alaska to the 2006 Kelly Cup and is a member of the club's Hall of Fame. He said the absence of the Aces will leave a void in Anchorage. "When a community loses anything that brings it together, it leaves a massive hole," Shasby said. He said it was difficult to see the reaction of his son, Camden, when he told the 12-year-old, who grew up watching his dad play and idolizes the Aces, that the team will no longer exist. "Just a look of shock and sadness on his face," Shasby said. "(The Aces) are imprinted in his mind. It's like losing part of your childhood." Rob Murray, the sixth-year coach who guided the Aces to the 2014 Kelly Cup, said the team's demise is difficult professionally and personally. He will be out of a job at season's end, as will goaltending coach Gerald Coleman, who backstopped the Aces to Kelly Cups in 2014 and 2011, and longtime equipment manager Mike Burkhead and trainer Scott McLay. "You're looking at livelihoods — for myself, Colesy, Burkie and Scooter. We're at a crossroads," Murray said. "All of us are in the position of trying to find a job that we didn't know we'd have to find. "It's hard. It goes down to my (five) kids. They all grew up here, except the oldest. They don't know anything but Alaska. It's my home. It's tough." Besides Murray and his staff, the Aces employ 20-plus players, 11 other full-time staffers and, on game nights at Sullivan Arena, a part-time crew of as many as 80. The economic repercussions of the Aces' demise will hit Alaska's largest city, and ripple beyond it, in a state burdened by a $3 billion deficit. The Aces are the anchor tenant at city-owned Sullivan Arena, where they play a minimum of 38 games per season — 36 regular-season matches and at least two exhibitions. No other group rents Sullivan Arena half as often as the Aces. The second-most frequent tenant is UAA hockey, which has 17 scheduled dates at Sullivan this season. The absence of the Aces almost certainly means less work at the arena for vendors, concession workers, janitorial crews, security staff and parking attendants. Joe Wooden, general manager for SMG, which operates Sullivan Arena, was not immediately available for comment. Airlines, hotels and restaurants will also take a hit. The Aces, who do not have an ECHL opponent in Alaska and fly to the Lower 48 for all road games, annually buy hundreds of plane tickets, principally with Alaska Airlines and its partners. Visiting teams book hundreds of hotel rooms in the course of a season and dine out here. Community groups will also be impacted. The Scotty Gomez Foundation conducts fundraising jersey raffles at Aces games. The Mountain View Lions Club sells Chuck-A-Puck foam pucks at home games to raise money. Various youth hockey organizations hold fundraisers through the Aces. And the club has long donated exhibition-game proceeds to groups that support cancer awareness, treatment and education. Less tangible, though certain, is that the end of the Aces diminishes a hockey community that last year saw UAA, the city's other high-level hockey team, targeted for possible elimination before being removed from the chopping block. "The Aces have been at the top of the hockey pyramid in Alaska for a long time," said Darryl Thompson, president of the Alaska State Hockey Association. "When this group bought this team out of bankruptcy, they did amazing things. "We see the Kelly Cups and the energy they brought to the community. The trickle-down effect will be great." UAA athletic director Keith Hackett, whose department has endured reduced state funding and faces more budget cuts later this year, said losing the Aces hurts the community and the sport, and is a reflection of Alaska's economic climate. "I feel bad for the Aces, I feel bad for the community," Hackett said. "You can't fault the ownership. It's a business. "It's a signal that discretionary income people had two years ago isn't there any longer. This is a tough time." Shasby, a schoolteacher who coaches three youth teams and serves as director of the Anchorage Hockey Association's Little Dippers program from players 8 and younger, said young players look up to the Aces as role models. Watching the Aces, he said, enhances their passion for the sport. "To kids in our town, it's the NHL," Shasby said. "It's going to be a hole in their development because it takes away a visual. There's no role model there, and it's tough. "It's a lose-lose for the town, for its economy and its culture." The Aces have long been the state's most popular team, averaging a franchise-best 5,152 fans per game in the 2006-07 season and routinely averaging more than 4,000 per game for nearly their entire history. Their most loyal fans are known as "The Cowbell Crew" for the noise-makers they clang during games. Burkhead, the Aces' equipment manager, recalled that soon after he and his wife, Mandy, arrived in Anchorage prior to the 2008-09 season, they were struck by how the community embraced the team and its players. "When we got here, guys were rock stars in this town," Burkhead said. 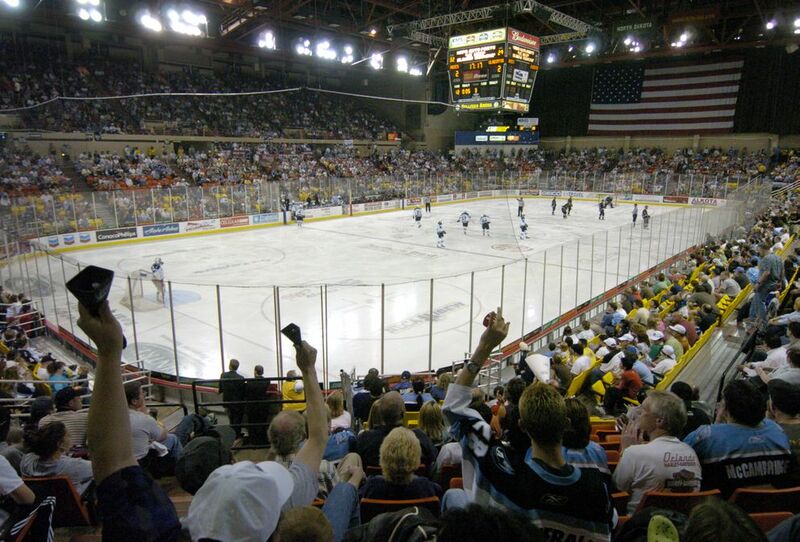 When the Aces entertained the South Carolina Stingrays in Game 7 of the 2009 Kelly Cup Finals — the Stingrays won 4-2 — a standing-room-only, cowbell-clanging crowd of 6,610 squeezed inside Sullivan Arena, where the atmosphere felt like a cross between a giant house party and a rock concert. The Aces averaged 4,682 fans per regular-season home game that season and attendance remained fairly static for the next five seasons. They averaged 4,619 fans per regular-season home game in 2013-14, when they seized the third Kelly Cup in franchise history. "The Aces have been the most visible thing in Anchorage for six months of every year," Burkhead said. But attendance has been in steep decline since the team's last Kelly Cup. Two seasons ago, the Aces failed to make the playoffs for the first time in franchise history. They failed to reach the playoffs again last season. Those stumbles coincided with Alaska's declining economic fortunes: low oil prices, a massive deficit and a recession. 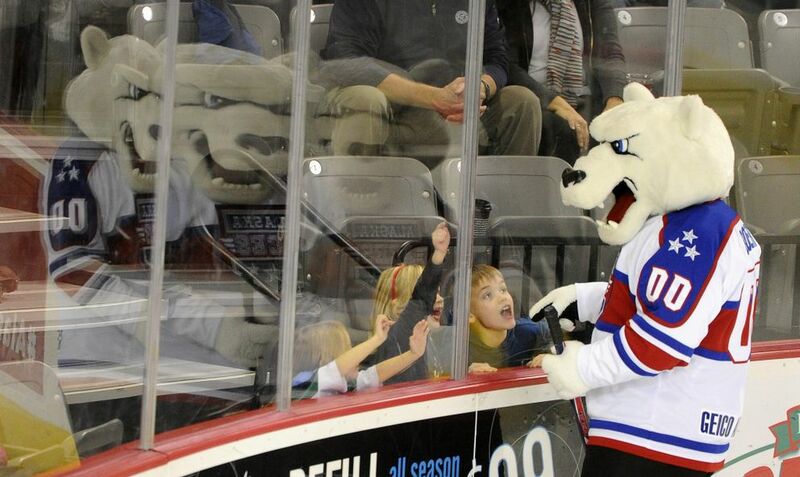 The Aces' average attendance in the past three seasons has plummeted 26.4 percent. In that same span, average attendance around the 27-team ECHL has fallen 11.9 percent, to an average of 4,146 through Tuesday's games from the 2013-14 league average of 4,706. Through 27 home games this season, the Aces have averaged 3,400 fans per game, the lowest in franchise history and the second consecutive season below 4,000. Parks said the Aces' season-ticket revenue has fallen by more than $250,000 annually and corporate sponsorship has dropped by $600,000 annually. And declining attendance this season, compared to last season, represents lost revenue into six figures. "It creeps up on you," Parks said. "It's not something that grabs you by the neck and throws you to the ground." Parks and Mackie said the city and its mayor, Ethan Berkowitz, have been supportive of the Aces. The city and SMG prior to the 2015-16 season renegotiated the team's lease at Sullivan to include more favorable terms for the Aces, including an increase in their cut of gross concession receipts to 40 percent from 35 percent. Still, the Aces say their losses are too great to continue operating. They did not seek any subsidies from local or state government. "Mayor Berkowitz and the administration did everything they could," Mackie said. "The mayor and I are in agreement — this is entertainment. This is not public safety, this is not road maintenance, this is not the People Mover. This isn't anything to do with the taxpayer." Berkowitz said he was saddened as both the mayor and a fan. "I've been thinking of a succinct way of saying it — I'm sad," he said. "The Aces have been a unifying force to bring people together, to celebrate victories, to mourn losses. "Those are the kind of activities that give us a common cause." 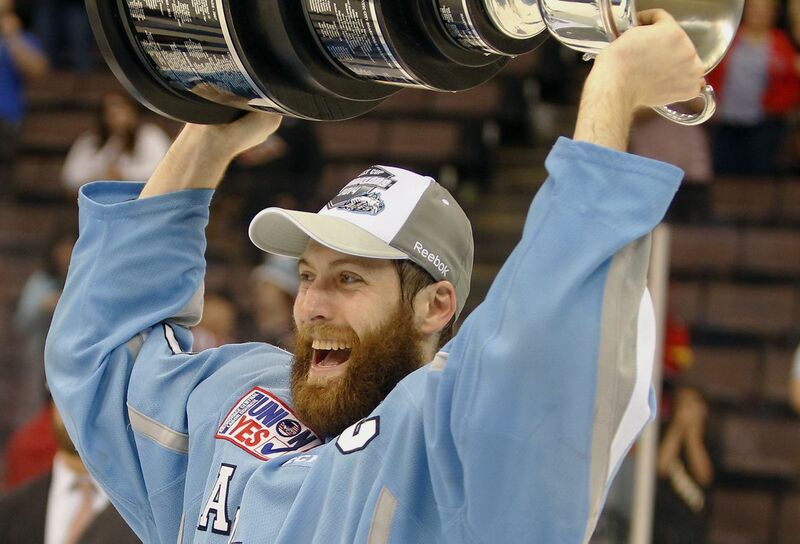 After beginning ECHL play in the 2003-04 season, it took the Aces just three seasons to become Kelly Cup champions under then-coach Davis Payne, who went on to become an NHL head coach. That run to the 2006 Cup included the two most famous goals, both on home ice, in club history. Cam Keith batted his own rebound out of midair after midnight in triple overtime of Game 6 to eliminate the Las Vegas Wranglers in the division finals and Chris Minard scored from the left wing in double overtime to eliminate the Fresno Falcons in Game 7 of the conference finals. The Aces also won the Cup in 2011 under coach Brent Thompson and in 2014 under current coach Murray — the three Kelly Cups tie them with the South Carolina Stingrays for most Kelly Cups. They also advanced to the Finals in 2009 under coach Keith McCambridge before losing to South Carolina in Game 7. Those highlights came during a 10-season span in which the Aces seven times reached at least the conference finals, the league's semifinals. Alaska has won a record five Brabham Cups as regular-season champions, including a record four straight from 2011 to 2014. The Aces entered this season with the ECHL's best all-time playoff winning percentage (.662) and the league's fourth-best regular-season winning percentage (.638). More than a dozen players who skated for the Aces later ascended to the NHL, the world's best league. That group includes winger Justin Johnson of Anchorage, who was released by both the Aces and ECHL Idaho, but kept grinding. He finally stuck with the Aces and ascended to the American Hockey League and, for two games, to the NHL's New York Islanders. And the Aces furnished a soft landing spot for local talent. Shasby and the Heisten brothers, Barrett and Chris, were among Alaskans who finished their careers with the Aces. Current Aces winger Tim Wallace of Anchorage is a former NHLer. The Aces also served as a haven for some of the best Alaskans to lace skates. Center Scott Gomez, the two-time Stanley Cup champion and 2000 NHL Rookie of the Year from Anchorage, played for the Aces during two NHL lockouts and was the ECHL's Most Valuable Player in 2005. Gomez and fellow NHLers Brandon Dubinsky, Nate Thompson and Joey Crabb all played for the Aces during the NHL lockout in the 2012-13 season. But with Thursday's announcement, an era is all but over. The Aces are scheduled to open a three-week, 10-game road trip on Thursday in Elmira, New York. They have just nine home games left, beginning with a series March 15, 17 and 18. Alaska's last regular-season game is April 7 at Sullivan, against the Idaho Steelheads. Unless the Aces make the playoffs — they're in playoff position now, though their once-strong hold on a spot has become tenuous of late — that game will be the last in franchise history. And a team that has won multiple Kelly Cups and Brabham Cups as well as divisional and conference titles and has reveled in that success by hanging banners inside Sullivan, will go dark. "We're incredibly grateful to our fans and sponsors," Mackie said. "Without them, we wouldn't have lasted 15 years. It's just the economic reality — we're no longer economically viable." As Mackie, a lobbyist, spoke on his cellphone from Juneau, a voice beckoned in the background: "We've got to save the Aces." "Sorry, Governor," Mackie replied, "it's not going to happen." Instead, inside a couple months, or a little longer if they make the playoffs, the Alaska Aces will skate their last shift. "Fans have asked us what they can do," Parks said, "and I said, 'Wipe the tears from my eyes.' "